Men of the state police command on February 15th arrested three of six students of Kwara State College of Health and Technology, Offa, who allegedly raped their female colleague in the institution to a state of unconsciousness. 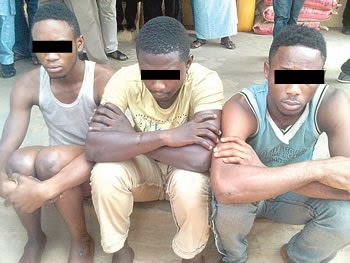 Aisabor, who said that the victim had been admitted at the University of Ilorin Teaching Hospital (UITH) in Ilorin for treatment, assured that the remaining three suspects who were at large would be apprehended and brought to book alongside their arrested colleagues. The police boss said items recovered at the scene of the incident included three used condoms, a bottle of Ponche liquor, one red lady’s pants, a pair of lady’s shoes and one Samsung handset belonging to the victim.